Training for judges in Turkmenistan – Аспектум. “Aspectum.” Partner Mikhail Antonov led training on the methodology of drafting administrative, civil law and criminal law court decisions developed for Turkmenistan judges on December 21-22, 2017. This seminar is a part of the European Commission funded project “Rule of law: the European Union – Central Asia” supported by the Supreme Court of Turkmenistan in Ashgabat. 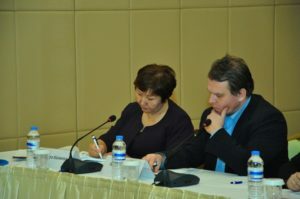 The training was attended by 30 Supreme Court judges of Turkmenistan and lower courts. The training was based on the court decisions preparation manuals written by Mikhail Antonov.